One can eat at the outward-facing bar at Jake's or take-out. I opted for take-out so we could have a photo-shoot. I asked the fellow behind the counter if he was Jake and he responded that he was Jake's grandson. He wouldn't claim to have the Best Corned Beef in Cleveland but he thought it was pretty good and challenged me to decide. So I ordered a Corned Beef Sandwich and asked him to make it the way he likes it. It came on rye with a mild white cheese (swiss?) along with a dill spear wrapped by itself. A very good sandwich, it was neither too dry nor too juicy. 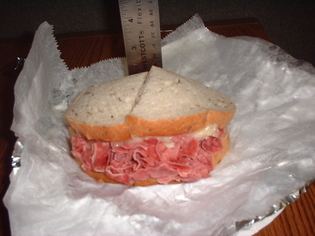 At about 2½, this sandwich seems to be about normal size. It was quite filling and very tasty, with lots of flavor. While it can't (yet) be said that For Goodness Jake's serves the Best Corned Beef in Cleveland, it can be said that they serve quite a good one. If you're in the Public Square area, drop by and tell Jake's grandson that we sent you. The Ontario Street Cafe at 2053 Ontario Street is near my place of employment. There you can find Carl and others behind the counter, serving sandwiches and other things. Their prices are reasonable, there's always plenty of sandwich and the folks are friendly to this regular (I usually get take-out and eat back at my desk). So it would only be natural for me to include this establishment on the trek through Cleveland's Best Corned Beef. To be fair, in writing, they only claim to serve "Old Downtown Style". Talk to them, though and you'll quickly get a strong sense that they would lay claim to the title. What did I get for my $6-and-change? A coke, deli pickle, chips, my choice of condiments, napkin, knife and a reported ½-pound of corned beef with some melted swiss between two pieces of rye bread. But how was it really? Besides being pleasing to the eye, it was delicious. A little dry for my taste, but delicious. I'm not sure I want to have corned beef juice running down my hand, but a little moister would have been good. It was tender, the flavor was just right and the swiss seemed just the right touch. The swiss was their idea, as was the mustard on the side. The horseradish, also on the side, packed a powerful punch and seemed to overpower the sandwich when I ventured to spread some on a portion. While it can't (yet) be said that The Ontario Street Cafe serves the Best Corned Beef in Cleveland, it can be said that they serve quite a good one. If you're in the neighborhood (Public Square), drop by and tell Carl that we sent you. As anticipated, the trip to The Blue Fig Bar and Grill was a bust. Not only did Jay tell me he suspected it was closed but several reconnaissance trips down the HealthLine toward home had shown me nothing to indicate that it was open, despite the tantalizing "Restaurant Open" sign in the front window. The consistently unlit "Open" sign did nothing to deter me either. What's not to get excited about? Free time and the weather aligned Thursday this week allowing me to stop at East 36th and Euclid to snap a few pictures of what may have been the best corned beef in Cleveland. What was there to lose? The sky was clear, the weather warm and it was still early April. By standing on a Euclid Corridor (Healthline) station island (yes, in the middle of Euclid Avenue), I was able to get some really nice shots of this now defunct restaurant. Not to be confused with the Blue Fig Hookah Cafe, the Blue Fig Bar and Grill appears to have been a "welcome retreat after a long day at Cleveland State or Tri-C". If anyone knows the story behind this establishment, please leave us a comment and we'll look into it further. Given that hand-painted "The Blue Fig Bar and Grill" sign seems to be placed over an older sign, I wouldn't be surprised if the "Corned Beef" sign around the corner belonged to an earlier restaurant at this location. I wasn't able to obtain a sample of their corned beef for rating purposes but the old "Corned Beef" sign has to be one of my favorites so far. The Chinese buffet on Cleveland's East 12th Street is where I first got the idea: collect pictures of all the eateries that claim to serve the "Best Corned Beef in Cleveland". Jay and I had been headed for the New Yorker Restaurant & Deli at 12th and Chester but finding it closed, crossed the street, settling for a Chinese buffet. It was there that he commented on the large number of restaurants claiming to have the best corned beef in Cleveland. I added a couple to his list from my wanderings in our city and an idea began to take form. Fast-forward to April 8th, 2009. The Wednesday manager's lunch was canceled so I paged one of the four regulars with my plans: order take-out from the Ontario Street Cafe (on Ontario Street!) and head back to the desks before our one o'clock. His idea was much better: grab a table and, by the way, he was bringing someone. So that day found the three of us eating lunch, talking about Pastrami on Rye and Corned Beef (among many other things). On the way out, I asked permission to take a picture of the nearby sign that proclaimed "Old Downtown Style Hot Corned Beef". A simple sign echoes throughout Cleveland. 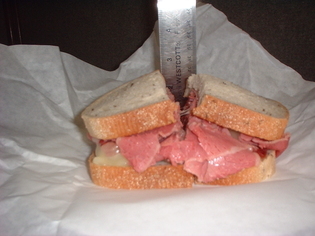 How many places serve Corned Beef sandwiches? How many claim to be the best? My lunch partners grinned in amusement. They could help catalog and collect—post things on a blog! I teased that I already had the website: BestCornedBeefinCleveland.com and when I confessed that I had not, they suggested that I go for it. Thursday morning it was mine and Thursday afternoon I made my first stop: "The Blue Fig". And today, Friday, April 10th, 2009, we begin with the inaugural post.